My 1998 West Vacation - 11 days, 4315 miles. Days 1 to 4, Home to Pocatello, Idaho. Believe it or not, one of the early incarnations of my 1997 vacation, was to route though both the Grand Canyon, and Yellowstone. That route lasted about 20 minutes. It wasn't the distance that killed the trip, it was the inability to see anything along the way. Once again I was awed by the sights and sounds of the West. The geothermal features in Yellowstone are like nothing else I'd seen. Here, beneath your feet, is a pocket of lava so vast that it could make the Northern half of the US a total wasteland. I would visit a place just for the history of it. A place that's now in the middle of nowhere, but caused a fundamental change in this country that would unite it, and for the first time make us a continental nation. I would also visit many of the places I did in 1996, but with a greater understanding of the history, geology and folklore. In addition to the 35mm SLR's, I would bring a Sony Hi-8 video camera, but its use, like that in the previous year, would be limited. In 1998, there was still no cheap, practical way to edit video. Jo once again couldn't take the entire time off, and I was on my own until Salt Lake City. 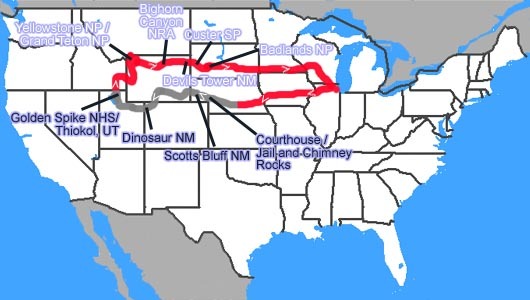 I left the morning of September 8, and did a speed run to North Platte, Nebraska. Courthouse and Jail rocks are the start of the Wildcat Range, one of the first landmarks the pioneers travelling the Oregon Trail could use to mark their progress. For most, these rocks marked the first third of their journey. The ruts from the Oregon Trail are still visible here. The pioneers called it The Nebraska Gibraltar. Scotts Bluff National Monument. 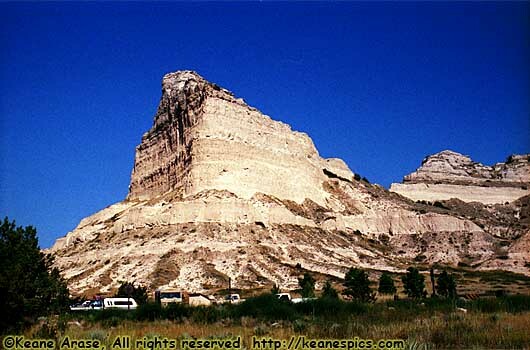 Scotts Bluff, also known as the Nebraska Gibraltar, is an imposing 800-foot high icon on the Nebraska Plains. Composed of sedimentary layers of sand, volcanic ash and silt, this rock could be seen for days as the oxen-drawn wagons approached it. The natives called it Meapate, or the "hill that is hard to go around," it became a fur trading post in the early 1800's. The name was changed to Scotts Bluff after a fur company clerk named Hiram Scott died near Meapate in 1828. I spent the night in Rawlins, Wyoming. I was gone at dawn, turned South toward Dinosaur National Monument, and got a nice sunrise in the middle of nowhere in Wyoming. Dinosaur National Monument is in the middle of nowhere, a third of it is in Northern Utah and the rest in Northwestern Colorado. It was originally only a dinosaur quarry when the park was designated a national monument in 1915. The majority of the park was added in 1938, to include the confluence of the Green and Yampa Rivers, as well as the canyons they carved through the nearby mountains. While there are some magnificent overviews in the newer areas of the park, it's the old section of the park, the Dinosaur quarry, that makes the park's namesake. In 1909, a paleontologist from the Carnegie Museum named Earl Douglass found this ridge after a search of more than a year. Many of the skeletons he excavated are still at the Museum in Pittsburg. Also here is the "Swelter Shelter", so named because it was documented by archeologists in the high heat of summer. My most vivid memory of Provo, Utah, was ascending the Wasatch Mountains in the pouring rain on a road under construction with the sun out and hitting your windshield at such an angle that you couldn't see. I spent the night in Provo, Utah, and the next morning got my oil changed in Bountiful. On August 12, 1805, Lewis and Clark's Corp of Discovery approached the Continental Divide. As they approached the Divide, they expected to see a gentle slope to the West, to the Columbia River. Perhaps a day's portage. That's what everyone told them they would see. Instead, they saw more mountains. At that moment, the 300-year-old dream, from the time Columbus discovered America, of the Northwest Passage, an all water route from Europe to the Far East, died. In 1863, the Central Pacific Railroad started laying track from Sacramento, California, and the Union Pacific Railroad from Omaha, Nebraska. They officially met at this spot on May 10, 1869, and at 12:47PM the transcontinental railroad was completed. The completion of this link between the East and the West fundamentally transformed this country like no other event in its history. No longer were the mountains an obstacle to travel. No longer would goods have to travel around South America to reach the other coast. It took the Mormons 2 years to get here from Nauvoo, Illinois in 1847. 10 years later, it could be done in 6 months by oxen drawn wagon. It could now be done in 4 days. The locomotives here are almost exact replicas of the Central Pacific Jupiter and the Union Pacific 119, the locomotives present when the final spike was driven. I was told when I was there (and cannot find any other reference), that when they painted the trains, they contacted the Disney Company for advice, since they had a fleet of brightly colored trains. Since all the photos of the actual event were in black and white, with no existing report of how the trains were painted, the final paint scheme is only a guess. Thiokol is just outside of Golden Spike, and it was a complete surprise to see it here. For all the other places I've said was in the middle of nowhere, Thiokol really is in the middle of nowhere. Considering the display they had out front, something clicked in my mind (more like grating of rusty gears), and this is where the old films of static tests of rocket engines happened. They also manufactured the solid rocket boosters for the Space Shuttle program when it was still in operation. It seems the only reason I'm at airports these days is to pick someone up or drop someone off... Jo would join me for the rest of the trip. End 1998 West Vacation - Part 1 of 5.